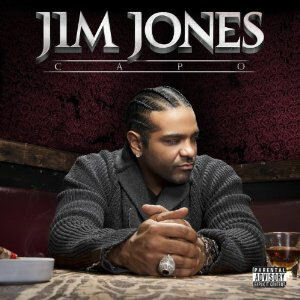 RapReviews.com Feature for April 5th, 2011 - Jim Jones' "Capo"
I routinely find myself at odds with not only the RR staff in general but the hip-hop populace as a whole when it comes to Jim Jones. Make no mistake, if he has a hit that crosses over to the mainstream, I enjoy it as much as the next man, because he does have (if nothing else) a charismatic delivery. In general though I find his flow to be overrated and his lyrical content to be nothing special whatsoever. Now far from being upset about this contradiction, it's the very sort of thing I encourage at RapReviews.com. I'd rather have a difference of opinion where one writer thinks he's hitting all the right notes, while I think he's struck all the wrong ones, because that just goes to show we are not clones who all have the same view of hip-hop. Furthermore these kind of contradictions cause us all to critically re-examine our opinions and remain open-minded about different genres and styles of the entire hip-hop diaspora. So far be it from me to dismiss Jim Jones entirely in 2011. He's got a lot going for him, not the least of which is that he's one of the most prolific artists to ever come out of Cam'Ron founded DipSet. This is the NINTH album by Jones we've covered since 2004, and there's probably at least a mixtape or two we missed along the way. If you count albums with Byrd Gang or the Diplomats the totals of his discography and releases reviewed both increase that much more. When you're #WINNING more than Charlie Sheen, there's no reason to slow your roll for the haters, and as long as each album continues to sell you keep on dropping more and more of what your audience wants. "Capo" is an interesting album in that it re-examines WHAT that audience wants. One thing they clearly wanted was for DipSet to stop beefing amongst themselves, so Cam'Ron and Jones squashed it and recorded "Getting In the Money" together. They also want Jones to be bi-coastal, so he links with The Game on "Carton of Milk." My roof missin, might have seen it on a carton of milk"
This ain't +West Coast Customs+ but I paint your Range"
Game completely slays him him over the high piano keys of this smooth slow-flowing track, but it's still a good duet. In fact one thing that Jones doesn't seem to be shy about on "Capo" is letting other people steal the spotlight, as long as he gets to be on the song and it's on his album. Raekwon owns "Drops Is Out," Rell sings his way to the more memorable performance on "Let Me Fly," Lloyd Banks and Prodigy both "Take a Bow" on an electronic Innovatorz track, and Wyclef's Haitian crooning gives "God Bless the Child" the glue the otherwise frantically busy track needs to stick together. Jones also shows a good sense of humor on the Aaron LaCrate produced "Everybody Jones," casually dismissing overly desperate chicks trying to hit on him. In turn the female in question is asking her friends in the audience what she has to do to get his attention, from starting a Twitter campaign to dropping down to under 20 pounds. It's something I honestly didn't expect from Jones - he's knocking girls for being too skinny and the public's excessive fascination with celebrity tweets. Good for him! Now I haven't entirely been convinced that Jim Jones is the greatest thing since sliced bread by one album. He's still nowhere near top 10 (or even top 100) as a lyricist, although by broad comparison to Byrd Gang and DipSet members he's always come out looking much better as an artist. He has to rely too much on his vocal tone and charisma to carry him when he runs out of things to say, though that doesn't happen to him nearly as much as it does his friend Cam. Still there are times on "Capo" where you'd think someone who considers themselves a captain would delegate even MORE to his subordinates, because he clearly looks more like a star when they push him up into the limelight than when he tries to stand in it on his own. Every track except one has at least one guest, but Sen City adds almost nothing I can call noteworthy and Chink Santana's just there for the hooks. Still if "Capo" is any indication of where Jones is headed in 2011 it's the first time in a while I can say that I'm looking forward to his next album.